If you’re a parent, you know that living with kids can mean your home looks more like a playhouse than where adults live. According to Realtor, the effect of kids on a house is something like that of a small tornado coupled with a tsunami, earthquake and fusion explosion. And if you still have young kids around, you’re likely too tired to deal with it, let alone focus on decorating your home. Yes, kids can present a challenge when it comes to home decor, but that also opens up the door to get innovative and create something totally unique. Whether you need more storage or space in your home, these four ideas can tackle your home challenges head-on. When you bought your home and imagined your kids growing up there, you likely didn’t think about play dates, holiday meals and afternoons of friends and family crowded into the living room. Seating space can get sucked away in a hurry, especially when your kids are no longer interested in just sitting around on the floor. An “L” shaped couch is one way to accommodate more seating without taking up too much precious space. Or you can think outside the box and turn an ottoman into a soft stool for an extra seat. A luxuriously upholstered ottoman is still affordable and offers multiple purposes. Choose a longer option with hidden storage that can seat two or three guests and open up to hide away toys when not in use. A multipurpose ottoman is just one way to hide your kids’ mess and keep your home looking stylish. If your children’s play area is in a recessed area without a door, add a colorful curtain to pull when guests arrive to hide the mess. A brightly colored sliding door attached to a mounted wall bar also transforms an otherwise doorless area of your home into a self-contained area. Your dining room may be one of the largest rooms in your house with an oversized table to match. And you probably already figured out your table quickly doubles as a homework station and craft area. But there is so much more you can do than just use your dining room as a dumping area for papers and toys. Transform your dining table into a game center with a table tennis cover that slides right on top. You could also ditch the dining table altogether and opt for a long, vintage picnic-style table with benches that can be moved away for a game of ping pong. When the game is over, transform it into a standing craft station for everyone to work on a family project together. When is the last time you counted up your kids’ crafts and creations whether they’re making bumble bees out of toilet paper rolls or creating photographs in a dark room at their high school? Chances are you’ve got more artwork than you know how to display and need more options to showcase it than on your fridge doors. A photo line or craft twine attached to your wall easily holds your children’s artwork with a few metal clips or old-fashioned laundry pins. Or take a look at where you have some blank real estate around the house. 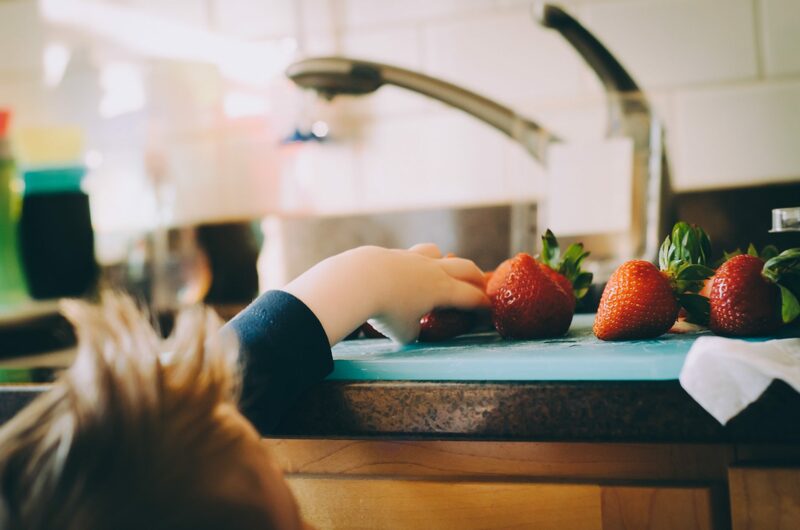 The side of a fridge or pantry can double as a gallery dedicated to your kids’ work of art that they can show off with pride. Instead of trying to decorate around your kids, focus on incorporating them into your home design. Soon you’ll have a house that reflects all of the individual styles of your family members under one harmonious roof.